March 27 (Bloomberg) Turquoise Hill Resources Ltd., the miner controlled by Rio Tinto Group, may ask lenders to extend financing for the $6.2 billion Oyu Tolgoi copper and gold project as talks continue with the Mongolian government. Current lender commitments expire on March 31, Vancouver-based Turquoise Hill said in a statement yesterday. Mongolia, which owns 34 percent of the project, has been in talks with Turquoise Hill and Rio about cost overruns and finalizing financing for further mine development. The discussions may not be settled until a study on underground development at Oyu Tolgoi is completed and approved and permits are received, Turquoise Hill said. "In this event, the shareholders will consider requesting an extension of the commitments from the project finance lenders and finalization of the Oyu Tolgoi project financing may be deferred to the second half of 2014," the company said. Oyu Tolgoi, which began operating in South Gobi last year, is the largest single investment in the history of Mongolia, according to the project's website. Turquoise Hill is required to fund the project's cash requirements until Sept. 1, 2016. Oyu Tolgoi had $6.8 billion in loans as of the end of 2013. The company also reduced production forecasts for Oyu Tolgoi after output in the first quarter was affected by equipment problems. The mine is now expected to produce 135,000 to 160,000 tons of copper in concentrates and 600,000 to 700,000 ounces of gold in concentrates for 2014, Turquoise Hill said. That compares with a Feb. 12 target of 150,000 to 175,000 tonnes of copper and 700,000 to 750,000 ounces of gold. First-quarter sales were slower than the company expected, as it reported a narrower quarterly loss. Turquoise Hill fell 1.6 percent to C$3.76 yesterday in Toronto. The shares have gained 7.1 percent this year. March 26 (Reuters) - Technical problems hit first-quarter production at Rio Tinto's Oyu Tolgoi copper and gold mine in Mongolia, and full-year output may be lower than previously forecast, Turquoise Hill Resources said on Wednesday. Turquoise Hill, which owns a majority interest in Oyu Tolgoi and is controlled by Rio, said rake blades in the mine's tailings thickeners failed, and also that some "debottlenecking" projects were put off to preserve cash. Full production resumed on Monday, Turquoise Hill said, and the mine is now expected to produce between 135,000 and 160,000 tonnes of copper in concentrates and 600,000 to 700,000 ounces of gold in concentrates in 2014. The company had previously said the mine was targeting between 150,000 and 175,000 tonnes of copper in concentrates and 700,000 to 750,000 ounces of gold in concentrates. Turquoise Hill reported its results for the fourth quarter. Net income was $138.4 million, or 11 cents a share, compared with a net loss of $145.0 million, or 11 cents a share, a year earlier. Revenue rose to $84.0 million from $1.3 million. Rio Tinto owns 50.8 percent of Vancouver-based Turquoise Hill, which in turn holds a 66 percent interest in Oyu Tolgoi. Rio operates the mine. Mogi: how about, eludes Mongolia? March 28 (Sydney Morning Herald) Rio Tinto faces more delays on its $US6 billion Mongolian copper and gold project after it was revealed that an agreement with the Mongolian government could be at least four months away. The partners have been unable to agree on a way to expand the Oyu Tolgoi mine for more than a year, and the Rio subsidiary in charge of the negotiations warned that an agreement may not come before a feasibility study was completed and agreed on by both parties. Billions of dollars worth of funding commitments for the expansion from international banks expire next week, meaning Rio is likely to need extensions from those banks, including the European Bank for Reconstruction and Development. The Australian government's Export Finance and Insurance Commission has also pledged to help fund the expansion, although its expiry is believed to be longer-dated than the EBRD's. The Rio subsidiary in charge of Oyu Tolgoi - Turquoise Hill Resources - said on Thursday progress had been made in talks with the Mongolian government and some disagreements had been resolved. The two parties have been at odds over the cost of the expansion, the benefits that should flow to Mongolia, and some environmental factors. But some issues remain, and may need the feasibility study to be completed midyear before they can be settled. Copper prices have slipped in recent months, but Turquoise Hill chief financial officer Christopher Bateman said he was confident the weaker prices would not damage the company's ability to raise more than $US4 billion. ''Debt capacity for the project really exceeds market capacity … we don't see short-term market gyration in the copper price affecting the finance ability of the underground,'' he said. Earlier this month Rio chief Sam Walsh said he would not rush the agreement just to meet a funding deadline. Oyu Tolgoi's first year has been dogged by challenges, including equipment failures that prompted a recent seven-week shut down of the concentrator. That shutdown has forced Turquoise to downgrade its production target for 2014 by about 10 per cent. Meanwhile, another Rio Tinto subsidiary may be forced to buy product from third parties to meet its supply contracts later this year. Uranium miner Energy Resources of Australia halted production at its Ranger mine after a radioactive spill in December. The company has enough stockpiles to meet its supply contracts until about June, but said it was starting to think about ways to meet its supply contracts if it is still shut down in the second half of the year. ERA - which is 68 per cent owned by Rio - said installation of new equipment in 2009 had led to December's burst leach tank. The Ranger site cannot restart processing until it has approval from the federal and Northern Territory governments. March 27 (WKRB News) Turquoise Hill Resources (TSE:TRQ)'s stock had its "sector perform" rating restated by CIBC in a research note issued on Thursday, American Banking and Market News reports. Other equities research analysts have also recently issued reports about the stock. Analysts at TD Securities cut their price target on shares of Turquoise Hill Resources from C$4.50 to C$4.25 in a research note on Tuesday, February 18th. They now have a "hold" rating on the stock. Four equities research analysts have rated the stock with a hold rating and one has issued a buy rating to the stock. The company currently has a consensus rating of "Hold" and a consensus target price of C$5.19. Turquoise Hill Resources (TSE:TRQ) opened at 3.76 on Thursday. Turquoise Hill Resources has a 1-year low of $3.20 and a 1-year high of $7.82. The stock's 50-day moving average is $3.89 and its 200-day moving average is $4.20. March 27 (WKRB News) Turquoise Hill Resources (NYSE:TRQ) was downgraded by Zacks from a "neutral" rating to an "underperform" rating in a research report issued to clients and investors on Thursday, American Banking News.com reports. They currently have a $3.20 target price on the stock. Zacks's price objective would indicate a potential downside of 5.33% from the company's previous close. Turquoise Hill Resources (NYSE:TRQ) traded down 1.47% during mid-day trading on Thursday, hitting $3.36. 2,861,370 shares of the company's stock traded hands. Turquoise Hill Resources has a 1-year low of $2.2579 and a 1-year high of $4.6166. The stock's 50-day moving average is $3.51 and its 200-day moving average is $3.11. The company's market cap is $3.381 billion. Turquoise Hill Resources (NYSE:TRQ) last announced its earnings results on Wednesday, March 26th. The company reported $0.10 earnings per share for the quarter, beating the analysts' consensus estimate of ($0.07) by $0.17. During the same quarter last year, the company posted ($0.17) earnings per share. On average, analysts predict that Turquoise Hill Resources will post $0.12 earnings per share for the current fiscal year. A number of other analysts have also recently weighed in on TRQ. Analysts at Cowen and Company raised their price target on shares of Turquoise Hill Resources from $8.35 to $8.69 in a research note on Friday, March 21st. Separately, analysts at UBS AG initiated coverage on shares of Turquoise Hill Resources in a research note on Friday, March 7th. They set a "buy" rating on the stock. Finally, analysts at TD Securities upgraded shares of Turquoise Hill Resources from a "reduce" rating to a "hold" rating in a research note on Tuesday, January 21st. Two equities research analysts have rated the stock with a sell rating, three have issued a hold rating and two have given a buy rating to the company's stock. The company has an average rating of "Hold" and an average target price of $7.13. VANCOUVER, BRITISH COLUMBIA--(Marketwired - March 27, 2014) - Entrée Gold Inc. (TSX:ETG)(NYSE MKT:EGI)(FRANKFURT:EKA) ("Entrée" or the "Company") has today filed its annual operational and financial results for the year ended December 31, 2013. The Company's Annual Report on Form 20-F has been filed with the SEC, and is available on the Company website. Shareholders can receive a free hard copy of the Company's audited Annual Financial Statements upon request. All dollar figures in this news release are in United States currency unless otherwise noted. Greg Crowe, President and CEO commented, "With the completion of our financing in early 2013, Entrée substantially added to its treasury, thus enabling us to focus on growth, rather than simply surviving. During these challenging economic times, opportunities are created for those companies that can operate from a position of financial strength. Entrée has continued to focus operationally on our core projects while also assessing other initiatives that have the potential to deliver long term value to our shareholders." "Concurrently, we have maintained ongoing dialogue with the Government of Mongolia in relation to the joint venture property, held in concert with Oyu Tolgoi LLC, which forms an integral part of the planned underground block cave operations at Oyu Tolgoi. We continue to advance discussions with the Government of Mongolia, and, while no definitive agreements have been finalized, we are continuing to make constructive progress." · On February 27, 2013, notice (the "Notice") was delivered to Entrée by the Mineral Resources Authority of Mongolia that the Ministry of Mining had cancelled the July 10, 2009 Order of the Ministry of Mineral Resources and Energy registering the Hugo Dummett (including the Hugo North Extension) and Heruga reserves. The Notice further advises that any transfer, sale or lease of the Shivee Tolgoi and Javhlant mining licences is temporarily restricted. · Entrée has been in discussions with stakeholders of the Oyu Tolgoi project, including the Government of Mongolia, OTLLC, Erdenes Oyu Tolgoi LLC, Erdenes MGL LLC and Rio Tinto, since the Government of Mongolia temporarily restricted the joint venture licences from transfer in February 2013. The discussions to date have focussed on issues arising from Entrée's exclusion from the OTIA, including the fact that the Government of Mongolia does not have a full 34% interest in the joint venture property; the fact that the mining licences integral to future underground operations are held by more than one corporate entity; and the fact that Entrée does not benefit from the stability that it would otherwise have if it were a party to the 2009 OTIA. Meetings to discuss possible ways of addressing all parties' concerns in a mutually satisfactory manner have been positive and constructive. No final agreements have been reached and further discussions with all stakeholders are required. · An updated mining plan based on reserves only and derived from the latest OTLLC technical, production and cost data was released by Turquoise Hill in March 2013. Entrée filed a separate technical report dated March 28, 2013, which discusses the impact of the updated mine plan on the Entrée-OTLLC joint venture property. Thunder Bay, Ontario, March 26 (FSCwire) - Mongolia Growth Group Ltd. (YAK – TSXV), a real estate investment and development company participating in the dynamic growth of the Mongolian economy via ownership of institutional-quality commercial property assets in Ulaanbaatar, Mongolia, is pleased to announce the release of Paul Byrne's Introductory Letter to Shareholders letter to shareholders. 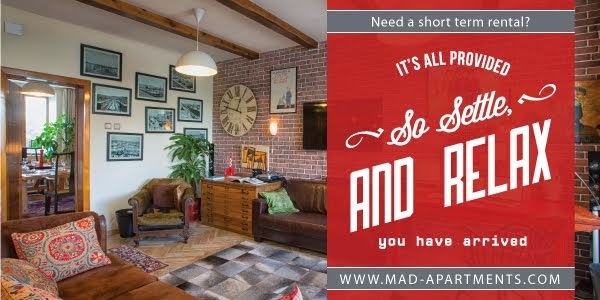 I have been in the property sector for almost three decades and have had the opportunity to be involved in many of the world's most exciting real estate developments and investments, ranging from major mixed-use developments and private equity property funds in the United States, to one of the highest profile property conglomerates in the Middle East, along with airports and rail. During this time, I have been fortunate to participate in leading dozens of real estate developments and infrastructure projects in emerging markets on various continents. It was while working on these real estate projects that I developed an appreciation for just how dynamic the emerging markets are and the speed at which they can progress and grow exponentially. As you look around the globe, over the past few decades, the vast majority of countries have seen substantial development, leading to mature pricing of property sectors, with diminished future returns for investors. Countries that have not advanced, have often been held back by highly unethical leadership in government, instability, civil unrest or other factors that make them impossible to invest in successfully. Mongolia is one of very few emerging market opportunities remaining for a property investor where the opportunity still exists to achieve substantial returns with minimal risk through development and investment in a stable economy and country. As I've explored the capital city of Ulaanbaatar, I've been struck by how much new property development is needed and just how much of the city will require redevelopment over the next ten years and beyond. Given the extraordinary wealth in mineral resources the country possesses, it is inevitable that economic development will be rapid. I see this situation creating an ideal opportunity for me, personally, to be positioned for the next upswing in Mongolian business activity, which is commencing as I write this to you and is the reason that I recently purchased CDN $250,000 of MGG shares. I have spent considerable time in the Gulf region over the past decade and prior to that in Hong Kong during the 1990s, where I observed the Asian emerging markets rise on the world stage. What I see in Ulaanbaatar very much reminds me of that unique period of time and gives me a sound road-map for where I believe MGG needs to head as a business. The key is that we need to focus on where the city will be in ten years, and then make sure that MGG capitalizes on that rare opportunity during the next five years. The market is evolving rapidly, and the current generation of buildings is already becoming obsolete. In particular, I believe that MGG needs to re-focus its attention on segments of the market where it will have a competitive advantage and where supply is unlikely to be built. This naturally means the construction of modern retail and office buildings in downtown Ulaanbaatar. During this past quarter, I have had a solid review of where MGG is today and where it needs to evolve to. Clearly, I'm impressed with what has been accomplished thus far or I would not have taken on the CEO responsibility and mandate. During the past 3 years, MGG has built one of the most credible property companies in Mongolia. The company has an excellent new development and redevelopment pipeline, including some of the choicest sites in Ulaanbaatar. Most importantly, the company has developed one of the only institutional asset management and development platforms with associated services in the country. This will be invaluable as the company moves onto the next phase of its growth and needs to attract non-dilutive forms of capital. That said; there is work to do in terms of upgrading the portfolio and disposing of non-core assets. The process was underway before I arrived and I have focused on accelerating the disposition of properties that don't align with our updated vision and strategies. While these properties appear to offer attractive yields, their small size serves as a distraction to management, which somewhat dilutes their yield. Going forward, we will be re-investing in larger property assets that are more institutional grade and very bankable. The other change that I am focused on is better use of the company's organizational resources. MGG's in-house asset management and development platforms are a substantial point of difference and should be seen as the most valuable enabling component going forward. As institutional investors begin to invest in Mongolian property assets, they will need a company to partner with that has a track record of success, along with audited financial statements. MGG is one of the only companies in Mongolia that has this sound track record, and the only one prepared for the unique needs of publicly listed companies. When you consider a traditional publicly traded property company, the business plan involves issuing shares and then acquiring property assets, followed by the issuance of more shares to acquire more assets. In a rising market, this would be an attractive model, but it does not allow shareholders sufficient leverage, while creating substantial dilution. I want to lead MGG towards a more rewarding business model with higher returns on invested capital. This model focuses on utilizing MGG's in-house capabilities and redirects the company into additional revenue streams creating a fee-for-service business model, which allows the company to leverage its existing infrastructure. On the less involved side of the spectrum, these services include strategic property advisory, leasing and brokerage. The complexity then moves on to third-party asset management and property management and finally into the highly lucrative field of funds management, where we manage property funds owned by third party investors. In essence, MGG will become a nimble Asset Management and Development Company offering fee-based services, engaging in high margin development and value added re-development along with owning residual interests in the resulting property assets. Important to the above, we are contemplating a longer term goal of developing an in-house REIT. This REIT would serve as the ultimate repository of MGG's stabilized property assets, including; the existing stabilized portfolio, the property assets resulting from MGG's unique ability to source and improve the returns on distressed assets, along with those assets created from its development pipeline. 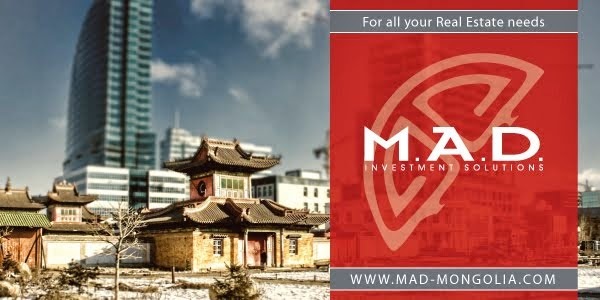 This REIT would have periodic liquidity events and be open to external investors looking for direct exposure to the Mongolian property market. By the nature of the investment vehicle, MGG is guaranteed to remain a substantial investor in it, aligning the interests of all involved. Ultimately, this would allow MGG to; recycle capital from successful projects into new ones, earn fee revenue off the management of the existing portfolio and retain a sizable ownership position in its past successes. Concurrent with the in-house REIT, MGG would seek out joint-venture partners who wish to co-develop our very attractive pipeline of current and future development projects. In this scenario, investors would have the assurance that a professional team will undertake the projects and have the property management team in place to add value after the development process finishes. Finally, should a liquidity event be desired, there will be confidence that the asset can be exchanged at market prices for shares in the REIT. This will be a substantial differentiating factor for those co-investing with MGG, compared to the current Mongolian property market, which lacks liquidity for sizable assets. In this way, MGG will be able to separate the asset intensive side of the business, from the much higher return on capital side of the business that utilizes our intellectual capital. Furthermore, this will reduce MGG's need for organizational capital at the holding company level as MGG has relied too much on the issuance of shares in the past to grow the business. Ultimately, I want to lead MGG into becoming very much like the highly successful Dubai based, Majid Al Futtaim (MAF) Properties, which I led. MAF was an Asset Management and Development Company that used the strategies mentioned above to leverage its internal infrastructure into abnormally high returns on capital for the holding company—while utilizing usual industry financial leverage. As a company, we now endeavor to pursue the corporate ethos of using our capital sparingly as co-investors in our own projects, while then earning fee revenue in perpetuity for managing those assets once completed. Chief Executive Officer of Mongolia Growth Group Ltd.
March 27 -- Modun Resources Limited ("Modun" or "the Company") is pleased to announce that it has completed settlement of the first tranche of a placement to sophisticated investors raising $310,000 via the issue of 155m shares at a price of 0.2c each. Modun has entered into placement agreements to raise $510,000 in total via the issue of 255m shares at a price of 0.2c each. Subscribers include a number of existing shareholders. Family interests associated with a director, Hugh Warner, have agreed to subscribe for $200,000. The share subscriptions by entities associated with Hugh Warner are subject to shareholder approval. Announcement made before Friday open. FEO trading -4.35% to A$0.044 midday. Total deal is for A$56.7 million in cash. Expected completion of the transaction was originally in March 2014. March 27 -- Reference is made to the Company's announcement dated 22 January 2014 regarding the sale of Topone Star Investment Limited (the "22 January 2014 Announcement"). All capitalised terms used in this announcement shall have the same meaning as described in the 22 January 2014 Announcement unless otherwise defined. 3. The parties continue to work towards obtaining of all relevant consents and approvals. As a result of additional time required for the satisfaction of certain condition precedents to the Agreement, the previously announced timetable is delayed. The parties are working towards satisfying the condition precedents as soon as practicable, and a notice of meeting will be dispatched in due course. March 27 -- Newera Resources Limited (ASX: NRU) is pleased to announce that it has secured additional funding by way of a convertible loan from a sophisticated investor in the amount of $50,000 (Loan). In accordance with the loan agreement, the loan will be converted, subject to shareholder approval, into convertible notes with a face value of $1,000 each (Notes). The Loan is an extension of the issue of convertible loan/notes totalling $500,000 which was completed earlier this month and does not constitute the capital raising event that sets the conversion price or represent the event that causes the existing notes to be eligible for conversion. · The Notes will be unsecured. The Convertible Notes will be issued to a sophisticated investors under sections 708(8), 708(10) and 708(11) of the Corporations Act 2001 (Cth) (the Act), without disclosure to investors under Part 6D.2 of the Act. Until shareholder approval is obtained, the Loan will accrue interest at the rate of 12% per annum. Should shareholder approval not be forthcoming, the Loan plus any unpaid interest will be repayable in cash on 6 March 2015. Further details will be set out in the Notice of General Meeting at which the Company will seek the necessary shareholder approval to approve the issue of the convertible notes. A date for this meeting will be announced in due course. The Board sees this as an attractive option to access sufficient capital to meet the ongoing programs of the Company in a way that limits the dilution to existing shareholders at this time. The capital raised will be applied to both the current working capital requirements of the Company and the development of its Ulaan Tolgoi project in Mongolia. VANCOUVER, BRITISH COLUMBIA--(Marketwired - March 27, 2014) - Prophecy Coal Corp. ("Prophecy" or the "Company") (TSX:PCY)(OTCQX:PRPCF)(FRANKFURT:1P2) announces that its Board of Directors (the "Board") has adopted an advance notice policy (the "Advance Notice Policy') effective March 25, 2014. The Company intends to seek approval from shareholders at the next annual meeting of the Company to amend the Company's articles to provide direction and a framework for the procedures contemplated in the Advance Notice Policy. If the proposed amendments to the articles are not approved at the meeting, the Advance Notice Policy will terminate and be of no further force and effect following the termination of the meeting. The Advance Notice Policy includes, among other things, a provision that requires advance notice be given to the Company in circumstances where nominations of persons for election to the Board are made by shareholders of the Company other than pursuant to either a requisition of a meeting made pursuant to the provisions of the Business Corporations Act (British Columbia) (the "Act") or a shareholder proposal made pursuant to the provisions of the Act. The Advance Notice Policy sets a deadline by which shareholders must submit nominations (a "Notice") for the election of directors to the Company prior to any annual or special meeting of shareholders, sets forth the information that a shareholder must include in the Notice to the Company, and establishes the form in which the shareholder must submit the Notice for that notice to be in proper written form. In the case of an annual meeting of shareholders, a Notice must be provided to the Company not less than 30 days and not more than 65 days prior to the date of the annual meeting. However, in the event that the annual meeting is to be held on a date that is less than 50 days after the date on which the first public announcement of the date of the annual meeting was made, a Notice must be provided to the Company not later than the close of business on the 10th day following such public announcement. By adopting the Advance Notice Policy, the Company seeks to establish an orderly and efficient process for electing directors at annual general meetings, or, if applicable, special meetings of shareholders of the Company and ensure all shareholders receive adequate notice of the director nominations and sufficient information with respect to all nominees to make an informed vote with respect to the election of directors after having been afforded reasonable time and information for appropriate deliberation. The Company believes this policy is in the best interests of the Company, its shareholders and other stakeholders. The Company also announces that the Board has also adopted a majority voting policy on March 25, 2014 with respect to the election of directors in uncontested elections. The policy provides among other things, that in the instance of a nominee receiving more "withheld" than "for" votes, such nominee will be required to promptly submit to the Board an offer to resign from the Board. The Board may refer the matter to the Corporate Governance and Compensation Committee or other committee to provide a recommendation to the Board whether to accept, or where there are extraordinary circumstances that justify it, reject a resignation offer. This policy will come into effect at the next annual meeting of shareholders of the Company in May of 2014. March 27 (infomongolia.com) On March 26, 2014, the Ministry of Mining of Mongolia hosted the regular monthly press conference themed "Transparent Mining", where Minister Davaajav GANKHUYAG, State Secretary at Mining Ministry Rentsendoo JIGJID and other officials reported their works carried out in the first three months of 2014. In their statements, authorities mentioned Mongolian Mining delegates had participated in the PDAC 2014 International Convention, Trade Show & Investors Exchange held in Toronto, Canada on March 02-05, 2014. During the visit, Minister D.Gankhuyag met with Minister of Natural Resources of Canada Joseph Oliver, who is currently serves as Minister of Finance since March 19, 2014. Mining Minister also met with Minister of International Trade of Canada Edward Fast, where parties exchanged views to strengthen partnership supporting foreign investment into Mongolia. On March 17, 2014, Minister D.Gankhuyag received Russian delegates led by President of Rosneft Company I.I.Sechin and during the meeting sides negotiated on long-term contract to supply oil products from Rosneft, moreover Mongolian Government re-affirmed its interest to import petroleum from Russia up to 1 million ton this year. According to the first quarter of 2014, 2.1 million tons of coal was exported, which is an increased volume by 23% compare to the previous year. The country expects to export 31.4 million tons of coal this year. In the first two months of 2013, a total of 506 kg of gold was sold to Central Bank and this volume increased by 2.6 times in February 2014 reaching to 1,320 kg. On March 10, 2014, the country's largest zinc-lead enrichment plant "Dulaan Khar" was opened in Bayan-Ulgii Aimag, Mongolia. In order solve the problems and difficulties faced on coal exports today, at the Cabinet meeting held on March 21, 2014, it was resolved to set a flexible tariff on coal exports that changes the tax system including mineral royalties and in the scope of new regulations, which is effective from April 01, 2014, coal will be exported under new tax tariff depending on how was made the contract. Before, taxes including mineral royalties for coal export used to be under one solid tariff, despite the international market price. As of March 25, 2014, the oil reserve at national level was estimated for 35 days, of which A-80 grade gasoline for 39 days, A-92 for 42, Diesel for 43 and TC-1 for 16 days. March 26 (BDSec) Volumes on the Mongolian Stock Exchange rose to MNT 169.6 million as 75,337 shares of Sor (SOR) or 8.5% of the company exchanged hands during the session as a block trade. MSE Top 20 index edged lower for the fourth day in a row to finish at 16,420.66 points, down -0.16% for the day. Naco Tulsh (NKT), a briquette producer, saw its stock down -10.59% to MNT 230 after being traded at MNT 270. 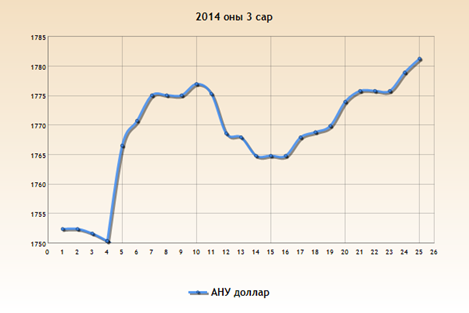 In September 2013, MSE-listed coal miner Sharyn Gol (SHG) acquired Naco's 92.9% of shares at MNT 209 per share. Among the day's best performing stocks, Gazar Suljmel (SUL) jumped 9.76% to close at MNT 45,000, hitting its all-time high price. Gazar Suljmel runs two duty free shops, one at Mongolian-Russian border frontier center and one at Ulaanbaatar Central Railway Station. March 27 (BDSec) MSE Top 20 fell a fifth straight day in a row today. The index came down 0.36% to sit at 16,361.71 points on Thursday. APU (-0.85%) and Tavantolgoi (-0.38%), the largest companies on the MSE, were the main draggers of the index today. Tavantolgoi (TTL), a coking coal producer in South Gobi, was the most actively traded stock of the day. 2,814 TTL shares changed hands at prices between MNT 5,100 and MNT 5,285 and closed at MNT 5,250. On the other side, Sor (SOR) jumped 14.65% to close at MNT 2,050. Naco Tulsh (NKT) rebounded to MNT 260 from MNT 230. March 27 (Bank of Mongolia) On the Foreign Exchange Auction held on March 27th, 2014 the BOM has received from local commercial banks bid offer 21.4 million USD and 31.4 million CNY. The BOM has accepted the offer by selling 21.4 million USD as closing rate of MNT 1780.00 and 31.4 million CNY as closing rate of MNT 287.05. On March 27th, 2014, The BOM has received MNT Swap agreement offer in equivalent to 11.0 million USD from local commercial banks and accepted the offer. Ulaanbaatar, Mongolia, March 24, 2014—IFC, a member of the World Bank Group, has partnered with Mongolian Bankers Association to introduce and implement sustainable banking practices to help financial institutions improve their environmental and social risk management, and contribute to greener and equitable economic growth. Mongolia – well-known for its rich natural resources – is committed to a low-carbon development path. Mongolian banks have been discussing sustainability issues with other stakeholders such as government agencies and corporates. Last November, 14 of the lenders publicly declared their commitment to promoting sustainable banking practices in the country. IFC will support the Mongolian Bankers Association's plan to develop the Mongolian Sustainable Banking Principles and industry guidelines by mid-2015. The guidelines will be based on international benchmarks such as the IFC Performance Standards, the World Bank Group Environmental, Health and Safety Guidelines, and the Equator Principles, a credit risk management framework for determining, assessing and managing environmental and social risk in project-finance transactions. IFC will also help build capacity in local banks, consulting firms, and training institutions to achieve this goal. "The partnership with IFC is part of ongoing efforts by Mongolian banks to contribute to green and inclusive economic development in Mongolia," said Norihiko Kato, Vice President of the Mongolian Bankers Association. "With help from IFC, the association will provide technical resources and knowledge to help our members improve their sustainable banking systems and products." The Mongolian Bankers Association is a self-regulated professional body initiated by 13 commercial banks, one development bank, four financial and non-financial banking institutions, and three foreign bank representative offices. Its vision is to lead the banking and financial sector in supporting the sustainable development and equitable economic growth of Mongolia. "The project will enhance risk management and expand lending to socially and environmentally friendly projects. This will help generate real results toward greener growth," said Tuyen D. Nguyen, IFC Resident Representative in Mongolia. "IFC's experience globally and in Asia has demonstrated a strong business case for sustainable banking." In addition to investments across multiple sectors in Mongolia, IFC is supporting this sustainable finance initiative through the Environmental and Social Standards for Financial Institutions Program in East Asia and the Pacific. The program provides advice to help improve the environmental and social sustainability of banks in China, Indonesia, Mongolia, the Philippines, Thailand, and Vietnam. Mogi: the new gold law applies to sales to BoM AND permitted commercial banks, unlike how I wrongly corrected Hogan Lovell's Anthony Woolley's quote to FT on this article, dated March 5. My apologies, Anthony. Ulaanbaatar, March 27 (MONTSAME) In the first two months of this year, the copper production reached 146.6 thousand tons, or the performance rate is 71.2%, and the molybdenum production--523.9 thousand tons or 108.2%. The Mining Minister D.Gankhuyag said it during the "Transparent Mining" monthly news conference Wednesday. The coal production reached 5.7 million tons or 44%. Since the beginning of 2014, Mongolia has extracted 3.6 million tons of coal and sold 3.6 million tons, of which 2.1 million tons has been exported. This shows an increase of 23% against the previous year, Mr Gankhuyag said, adding that the country intends to export 31.4 million tons of coal this year. Since adoption of the amendment to the mineral law, the Bank of Mongolia (BoM) received 1.320 kg gold. It was 506 kg in February of 2013, the Minister said. The iron extraction reached 340 thousand tons in the first two months of 2014, which is equivalent to 26.1% of the figures planned. Furthermore, the zinc production was 18.1 thousand tons or 123.9%, the size of oil production--1,020.4 thousand barrels or 104.6%. Thus, the tax revenue constitution reached 47.2 billion togrog or 163.8%, the Minister said. March 26 (infomongolia.com) On March 26, 2014, Chairman of State Structure's Standing Committee A.Bakei and Secretary General of the Parliament Secretariat B.Boldbaatar have called a press conference regarding the upcoming 2014 Spring Plenary Session of the State Great Khural (Parliament). In his statement, Chairman A.Bakei said, "The 2013 Autumn Plenary Session of Parliament closed on January 30, 2014 and during the break it was planned to hold an irregular session, but chairmen of party groups at the Parliament deemed it is not necessary to call. Although the State Structure's Standing Committee is scheduled to meet this week and agendas for Spring session will be approved". Secretary General B.Boldbaatar added, "The Opening of Spring Plenary Session is held on April 05 annually, but this year the day falls on Saturday, thus 2014 Spring Plenary Session of the Parliament will start on Monday, April 07". Ulaanbaatar, March 26 (MONTSAME) The Minister of Road and Transportation A.Gansukh Tuesday submitted to the Speaker Z.Enkhbold a parliamentary draft resolution on approving a state policy in auto road transportation sector. The Minister says that many problems face Mongolia's auto road sector, for example, unregulated transport has been triggering a "black" economy, a number of road accidents is still high due badly prepared drivers, there are no responsibility and technical knowledge on roads. "By having adopted this policy document I want to deal with such problems and to change standards of auto road transportation services", he says. The draft resolution has clauses on a legal environment of auto road transportation, functional and structural reforms for this policy, human resources matters, safety of all transports for passengers and freight, and technical and technological policy. Parliament firstly approved the law on auto road transportation in 1999 to regulate the legal environment for this sector. In 2013, this sphere accounted for 57% of the total freight transportation and 98.7% of passenger transportation. Moreover, the country registered 673 thousand 106 vehicles, of which 431 thousand 938 are cars. In the last five years, Mongolia has imported 50 thousand vehicles. Ulaanbaatar, March 26 (MONTSAME) The Minister of Justice Kh.Temuujin Tuesday submitted to the Speaker draft amendments to some laws. The Minister wants to amend the laws on criminal procedure and on adjudication of administrative cases. Mr Temuujin also submitted a draft amendment to the law on adjudicating civil cases in court. It reflects some principal alterations in harmony with the laws on court, on legal status of judge, on court administration, on reconciliation and on legal status of civil representatives at court. Ulaanbaatar, March 26 (MONTSAME) On Tuesday, some MPs submitted to the Speaker a draft law on trade. Su.Batbold, D.Demberel, Ya.Sodbaatar and J.Enkhbayar say that a lack of information about the commercial sector and its statistics causes problems in determining the trade sector's policy and making slower a decision making process. The country needs to specify and consolidate the registration and information on trades, to create a general data and to use them in research, state policy and decisions. The draft with 29 clauses in nine articles aims to create a legal environment for regulating the relations related to the domestic and external trade taking into account the above requirements and the government action programme, the MPs say. March 27 (news.mn) Erdenes MGL LLC, (Erdenes MGL) a government-owned mining company is to be restructured as a corporation. The company currently represents the Mongolian Government's interests in strategic mineral deposits, prospecting, exploration, and mining licenses. It also conducts operations and makes reserve assessments for strategic mineral deposits with state budget-funded prospecting and exploration. Further, it holds government-owned shares of corporate entities that conduct mining operations in the above mineral deposits. "Erdenes MGL" is planned to be developed using Singapore corporation standards. It is planned that the Board of the corporation will be comprised of 30 percent foreign experts, 30 percent native Mongolian leading managers and 30 percent former senior government officials. O.Sainbuyan, the CEO of Erdenes MGL, commented on the restructure saying the company intends to take steps to move onto the stock market in order to improve its activity as a corporation and to support its subsidiary company's finances. O.Sainbuyan added that the company is not in a hurry to move onto the stock market until the legal environment has been improved and internal and external factors are improved. As currently economic growth is slow, mining production prices are weaker in the world market. However, the company does plan to put several mineral deposits into production this year. Ulaanbaatar, March 26 (MONTSAME) Mongolian mining companies are participating in the Mines and Money international forum kicked off Monday in Hong Kong. Organized by the British Beacon Hill Resources company, the annual forum has convened leaders of the world's mining companies, investors and newly born players at the world mining market. Mongolia is being represented by leaders and officials of the "Haranga Resources", "Wolf Petroleum", "Undor Tolgoi Minerals" (Mogi: changed name to Khot Infrastructure Holdings), "Sharyn gol", "Hot-Ded Butsets", "Aspire Mining", "Erdene Resource" and "Nomin-Ord" companies. They are introducing to the participants results of their works, estimated resources and the size of investments they need. At the forum, a chair of the Mongolian delegation and the Vice Minister of Mining O.Erdenebulgan has noted that the legal environment for mining sphere has become more sustainable thanks to amending the investment law and the state policy on mineral resources. Mentioning that the investments flow to Mongolia is activating now, Mr Erdenebulgan urged companies to invest the Mongolian mining, hoping that responsible investors will become reliable partners of Mongolia. This year's Mines and Money HK forum has established itself as Asia-Pacific's premier event for mining investment deal-making and capital raising. The event showcases hundreds of mining companies in a 270-booth exhibition, connecting them with 1,000 investors from the world's largest mining funds, private equity firms, alternative financiers and private wealth. During the five days learning and networking, 3,000 attendees from across the globe will hear insights and analysis from our largest ever speaker line-up of world-leading investors and mining entrepreneurs. March 27 (UB Post) Mongolian and Chinese business operators and investors met on Thursday at the Foreign Affairs Ministry. The event, organized by the Mongolian Job Provider's Union, was attended by more than 120 Mongolian and Chinese business delegates. At the event, Prime Minister N.Altankhuyag remarked, "The recent changes made to the investment legal environment of Mongolia has made the investment climate more stable and understandable for business operators, and diminished bureaucracy and further hustle in doing business." He also noted that foreign and domestic investors will be viewed from the same angle and given equal opportunity. During the meeting, Chinese business delegates noted the improvements made to Mongolia's investment environment and said that it provides more opportunity for foreign businesses. But they also noted that it provides more opportunity for new investors, while the interests of longstanding relations have been forgotten. The Chinese delegation asked the Mongolian state to be more flexible in this matter, especially in regards to Chinese employment import quotas and land issues that are constantly present. The Mongolian side noted that the amount of coal exports and prices are low and that renegotiations need to be made. The Chinese delegation noted that although China's demand for coal has decreased, it has made no changes to its importation amount, and that they are ready to assist Mongolia in improving the competitiveness of its coal production, especially in regards to its quality. With demand for electricity on the rise, and a national drive to boost renewable power production gathering strength, investor interest in Mongolia's fledgling wind energy industry looks set to grow. The government aims for renewable sources to account for at least 20 percent of power generation capacity by 2020, up from three percent today. It is also keen to export renewable energy, although significant investment will be required if Mongolia is to achieve its objectives. On February 19, the German firm, Ferrostaal Industrial Projects, announced plans to invest 120 million USD in the Sainshand wind farm project, which is located in Mongolia's Gobi Desert. Managing director Klaus Lesker said the company would take on the role of project developer, while working with local partners to boost foreign investment. A power purchase agreement and operating licences have already been signed. Once completed, the 52-MW facility will provide power for the national distributor. 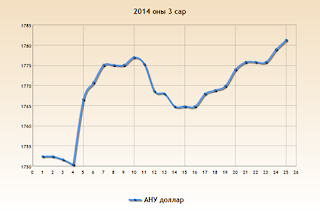 Operations at the wind farm, Mongolia's second such venture, are expected to begin in late 2015. The country's first wind energy facility, a 50-MW farm located to the south of the capital in Salkhit, is run by Clean Energy, a renewable energy company jointly owned by Mongolian conglomerate Newcom, General Electric Pacific, the European Bank for Reconstruction and Development, and the Netherlands Development Finance Company. The 120 million USD venture began operating in mid-2013 and feeds into the national grid. Wind and solar combined account for around five percent of Mongolia's 955-MW installed capacity, Ministry of Energy figures show. With the ministry forecasting peak demand to reach 2321 MW by 2020, the country will require significant investments in generation capacity over the coming several years. While coal-fired plants – which account for the vast majority of capacity – are being upgraded and expanded, one alternative is to build additional wind farms. In an interview given to OBG, B. Unenbat, the CEO of Newcom, described local wind resources as "good-to-excellent, equivalent to 1100 GW of wind electric potential". Further government incentives may be necessary to boost investment, however. The state has already introduced initiatives such as feed-in tariffs for producers at above-market rates over extended terms. Last year also saw an easing of restrictions on foreign investment. According to Unenbat, an increase in public-private partnerships (PPPs) in the energy sector could help the country secure its energy independence. "Mongolia's private and public sectors need to increase cooperation and collaboration to ensure we are all on the same page, with clear and defined roles for each project, creating a win-win scenario for all parties," he commented. Mongolia has, in addition, set its sights on carving a niche as a distribution centre for renewable energy. President Elbegdorj last year mapped out plans to utilise the country's wind energy resources as a means of exporting power to China and elsewhere in Asia. Taiwan is also keen to tap the industry's potential, signing a memorandum of understanding with Mongolia on renewable energy development in February, which set out terms for establishing strategic partnerships in the sector, building links and promoting greater use of wind and solar power. While Taiwan will be providing training to Mongolian officials in energy sector management, Taipei is also focusing on the investment and business opportunities that are opening up. Taiwan's Ministry of Economic Affairs said in a statement that the agreement would allow local companies greater access to an "extensive market" with vast renewable energy sources. Mongolia's drive to diversify its energy sources stems from both rising demand and an awareness of the damage inflicted on the country's ecosystem by fossil fuels. Many Mongolians use coal for household heating, which exacerbates the problem. The World Bank estimates that pollution rates in the capital of Ulaanbaatar are among the highest in the world. The knock-on effects of Mongolia's pollution problems are evident. According to the UN Environment Programme, average temperatures have risen by 2.1 degree Celsius over the past six or seven decades, approximately three times faster than the global average. Concerns are growing that higher temperatures could, in the future, lead to a loss of pastureland, a permafrost thaw and glacial melting. A drive to boost growth across Mongolia's renewable energy sector will help address these issues, while providing opportunities for companies along the supply and management chain. March 23 (Meniscus) Mongolian designer Ariunaa Suri featured cool clothes on the Tokyo runway that would appeal to other fashion capitals, such as New York or London, thanks to their edginess, asymmetry and simple lines. Most pieces were constructed in shades of black or grey with the occasional neon yellow thrown in. For the women, Suri sent out raw-edged leather jackets, and satin/silk dresses and skirts that contrasted well. Menswear included less commercial fare, including a cowl top, as well as slightly pointed platform boots that matched the women's footwear. March 26 (infomongolia.com) On March 25, 2014, the Bloomberg TV Mongolia has organized the "Bloomberg Awards 2013" ceremonial event bestowing the prominent individuals and enterprises in the socio-economic development of the country, and best programs and projects been successfully implementing. The ceremony was held at the Blue Sky Tower in Ulaanbaatar, where candidates and programs were promoted in eight nominations, namely Best Innovation of the Year, Outstanding Achievement, Best Manager, Top Economist, Best Executive Director, Best Management, Best Enterprise and Audience Award. The System has been installed at Property Registration Offices in 9 Districts of Ulaanbaatar city by connecting with 11.5 thousand meters long fibre optic cable. In addition, under the project 12 million paper documents were converted into an electronic form file archive and a data center of integrated online system was also established. As a result of the implementation of this program, more than 30 thousand households were involved in low-interest loans and were provided with housing. Further, in the scope of the long-term implementation of this program, it would impact positively to Mongolian financial sector stabilization and the challenges of air and soil pollution reduction. B.Batsaikhan has been becoming as a bridge of international brands to Mongolian customers and created new standards and new appearance in advertising field. Top Economist - Executive Director of TDB Capital and First Deputy CEO of the Trade and Development Bank of Mongolia (TDB), O.Orkhon. In the past, O.Orkhon played an important role as underwriter in the Samurai Bonds released on Japanese market amounting at 30 billion Japanese Yen with a 10-year maturity at 1.52% coupon. The contract was made between the Development Bank of Mongolia and the Japan Bank for International Cooperation. Although foreign currencies have become stronger against Tugrug (MNT), the Gobi Company's sales increased 20 percent last year earning 48.7 billion MNT. In 2013, Gobi CEO Ts.Baatarsaikhan concluded a contract with "Tavan Bogd" Group introducing one of the world's largest fast-food chain restaurants "KFC" by "YUM! Brands" in Mongolia. Currently, three "KFC" branches are operating in Ulaanbaatar. The Company has started to carry out renewed managements for state-owned companies that operate at large deposits and in the frameworks "Erdenes Oyu Tolgoi", "Erdenes Tavan Tolgoi", "Baganuur", "Shivee Ovoo" and "Erdenet" JSCs are included. "Erdenes MGL" LLC is providing optional solutions for infrastructure projects that aim to increase the efficiency of mineral products, besides implementing "Mongol Coal" and "Mongol Copper" projects to produce end-products in Mongolia. The Company introduced fully automated logistics center in 2013, which is the first constructed facility in Mongolia. In a newly established brewery, "Kaltenberg" products are being exported to South Korea and Germany. "APU" Company with production capacity of 27 million liters of milk, 15 million liters of juice and 3 million liters of plain and fruit yoghurt per year, alone paid one billion MNT in taxes to the State Budget of Mongolia. The Program characterizes at which level would reach Mongolia's development by 2050 and how big the state participation. If domestic economy to grow at constant until 2050, Mongolia's Gross Domestic Product would reach 380 billion USD, and the GDP per capita is expected at 55,000 USD respectively. Name of training: "Mongolia orientation"
Once again, Mongolia has become an attractive destination for foreign investors and foreigners. In this connection, it is important to give the foreigners a correct understanding about Mongolia, the Mongolian people, culture and traditions. As many foreigners coming to Mongolia have a limited knowledge and information about Mongolia, with this Orientation Training we intend to provide the foreigners and expats living and working in Mongolia with a full range of information about the country and its people, with aim to ensure an easier and softer adaptation to a new and completely different environment. Mongolia is a country of extreme climate, and of people with singular lifestyle, particular traditions and unique nomadic culture. Compared to other Asian countries, here the Asian and European cultures converge into one rich symbiotic culture. Understanding the singularity of Mongolian people, the highly adaptive people, will help the foreigners to effectively relate, communicate and work with our people. Our training is delivered by renowned researchers and lecturers from the Mongolian Universities, organized in a comfortable and luxury environment. March 27 (UB Post) There was a time when Mongolians considered only eyelid surgery as cosmetic surgery. But it has changed now. Whereas some people go to highly developed countries for cosmetic surgery, there are many women that prefer Mongolian cosmetic surgery instead, as it is reasonably priced and performed at a professional level. We spoke with D.Todnombat, operating surgeon of Tod Kannam Cosmetic Surgery Hospital, about the current and future trends in this industry. -Public understanding of cosmetic surgery has changed compared to previous years, and when your hospital was established. What kind of surgeries does your hospital conduct? -It has been a year since our hospital was established. Since that time, we have had our own customers. Our hospital is a cosmetic surgery hospital, so we conduct reconstructive surgery and all kinds of cosmetic surgeries. -What kind of services do your customers mostly choose? How marketable is cosmetic surgery? -Recently, girls and women are paying more attention to non-surgical procedures to become beautiful. Skin tightening injections and face lifting with threads are the most popular among women. - What is the difference between reconstructive surgery and cosmetic surgery? People consider cosmetic surgery as eyelid operations, nose, lips, mouth and breast surgery. Generally, they think it is a way of looking nice. But this is just one part of this branch. Reconstructive surgery is one of the branches of medical science. Medical science is divided into internal organs, the nervous system, cardiovascular system and so on, and in the same way, cosmetic surgery is divided and specialized. Plastic surgery is one part of it. That is why people can't define creating a higher nose and increasing breast size as all there is to cosmetic surgery. Improving reconstructive surgery and making it more technical in Mongolia is our hospital's purpose . Unfortunately, here there are not specialists and schools in this field of medical science. For that reason, I established my hospital to develop this field after I studied in Korea. Besides conducting cosmetic surgery and looking nice, we conduct reconstructive surgery that originates from any injuries. Making a higher nose is not only cosmetic surgery. It includes both cosmetic and reconstructive surgery. Making the nose nice is cosmetic surgery and fixing a nose injury or a curved nose is reconstructive surgery. -For now, if you compare Mongolian cosmetic surgery with other countries, what level has it reached? What are the difficulties facing this surgery? -This branch is a relatively new branch, so to make its foundation better, we have to invite and employ foreign specialists where cosmetic surgery has been developing very well and learn from them. There are many surgeries that are impossible to conduct. For instance, reconstructive surgeries such as jaw and cheekbone surgery, and birth defects. These difficulties are faced because of the lack of specialists and equipment. So, we have to prepare trained staff and specialists overseas. Cosmetic surgery can be very expensive. If we can improve the field, expenses will decrease. -For hospitals, equipment is really important in addition to the specialists. The capacity of a hospital's equipment must be powerful. What about your hospital? -It is really hard to imagine conducting cosmetic surgery without its equipment. Very small micro-elements of surgery are done by the equipment and some of them have silk-thin points. We have a fat aspiration apparatus, reconstructive and fat melting apparatus. -There is talk that some people have become victims and that overseas specialists who work in Mongolia have poor qualifications. What do you think about this issue? Where are your consultant doctors from and what are their professional skills? -When society develops more, people also try to go with this development. In order to look nice and be confident, people have surgery. This is social phenomena. Countries where the cosmetic surgery has developed well also faced the same problems as us. Surgery is not an easy thing. Cosmetic surgery is really hard and every surgery has risks. That is why there is a standard. If we conduct surgery according to standards, there will not be any difficulty. Becoming a victim of cosmetic surgery depends on doing or using the wrong things. In Korea, there are many cosmetic surgery hospitals and surgeons, and it is really competitive. So, there can be such gossip. But about our hospital, our consultant doctors are my teachers and professors of joint hospital and universities. -Compared to previous times, people have stopped using silicone. Besides increasing breast size, does your hospital increase the size of lips and buttocks? What kind of material do you use instead of silicone? -The materials used in cosmetic surgery have been changing constantly. Silicone is not being used since it causes cancer. So, implants that are used for increasing the size of breasts and buttocks have been updated. We are using something gel-based instead. And we advise that people not have lip surgery because silicone in the lips doesn't look so nice, and after a certain time, it loses its shape. March 26 (infomongolia.com) On March 26, 2014, Governor of the Capital City and Mayor of Ulaanbaatar E.Bat-Uul received in his office the Chairman of the Mongolian-British Chamber of Commerce John Grogan, where Ambassador to the United Kingdom of Great Britain and Northern Ireland of Mongolia N.Tulga, Deputy Mayor of Ulaanbaatar responsible for Finance and Economic Issues N.Bataa, Director of Economic Development Division at Capital City Administration E.Temuulen and other officials were present. During the meeting, Chairman J.Grogan noted, "Mongolian-British Chamber of Commerce is planning to host a big scale forum on investment and economy in London in September 2014, where issues will be touched upon on Mongolia's accountancy to bring at international level, to create linkages on domestic and international laws and regulations, besides to discuss issues such as creating a favorable environment for investment. Moreover, it is expected to consider how much close partnership between Capital City Administration, Government and private sectors". Also, Chairman J.Grogan invited Capital City authorities to take part in the Forum and asked the current procedures of Ulaanbaatar bond to be issued soon. In response, Deputy Mayor N.Bataa said, "Preparation works for Capital City Bond have been carried out that took a year-round and as of today, a loan rate of the bond was calculated and debt management issue was also competed basically. The bond issue will be discussed at the upcoming City Council meeting in April and then to submit to the Cabinet of the Government of Mongolia". Mayor E.Bat-Uul added, "The Capital City is planning to release a single-bond worth about 370 billion MNT. I will be attending the upcoming Forum in London myself and hope fruitful collaboration with you particularly in investment and bond issues". WASHINGTON, March 27, 2014 (American Forces Press Service) Next week, Defense Secretary Chuck Hagel will convene the first U.S.-hosted meeting of the Association of Southeast Asian Nations, Defense Department Press Secretary Navy Rear Adm. John Kirby said today in a press briefing here. Following the meeting, Hagel will travel to the Asia-Pacific region for visits with his counterparts in Japan, China and Mongolia, Kirby added. The trip will be Hagel's fourth official visit to the Asia-Pacific, a region of growing importance and emphasis for U.S. foreign policy and its defense strategy, the press secretary said. Hagel's final stop will be in Mongolia, the first visit there by a U.S. defense secretary in nearly 10 years. Mongolia is becoming a more important security partner for the United States, having deployed forces to Iraq and Afghanistan and in peacekeeping operations worldwide, Kirby said, and during the visit Hagel will thank Mongolia for its contributions and discuss ways to enhance future U.S.-Mongolian cooperation. Kirby said that, as one of the world's fastest-growing economies, Mongolia has a growing stake in stability across the Asia-Pacific region and he expects Hagel and the leaders there also to discuss regional security matters. "This trip to Asia, his fourth in less than a year, is further evidence of the secretary's personal commitment to the president's rebalance to the Asia-Pacific region," the admiral said, adding that the strategy is fully supported in the QDR and resourced in the president's budget. Most importantly, the strategy and budget shift the military from a focus on protracted counterinsurgency operations, he said, "seeking instead to regain full-spectrum capabilities that are relevant not only to Asia but to the challenges we see across the Middle East, and potentially even in Europe." Kirby added, "The priority this budget places on high-end capabilities and readiness is exactly what we believe is most relevant in a volatile and threatening world where America's global commitments are and will remain sacrosanct." March 27 (UB Post) Chairman of the Standing Committee on Security and Foreign Policy of State Great Khural Ts.Oyunbaatar received Rear Admiral Pascal Ausseur, Chief of the French Joint Staff/European Union/NATO/UN Division, and Ambassador Extraordinary and Plenipotentiary of France to Mongolia Yves Delune at the Government House, on March 27. They visited the Mongolian Ministry of Defense, National Emergency Management Agency, and General Authority for Border Protection. At the beginning of the visit, Rear Admiral Ausseur mentioned an interchanging program of officers from Mongolia and France to exchange experiences, and said he is working as Deputy Director in Charge of the DGA Asia-Pacific sub-directorate for the next two years. Ausseur spoke about 20 billion USD in spending for the arms industry, to produce naval, aircraft, and space technology. He emphasized that France is the only country in the European Union that has an independent arms industry. The Admiral expressed his confidence that Mongolia has the opportunity to cooperate in this sector. Chairman of the Standing Committee Ts.Oyunbaatar said Mongolia and France share hundreds of years of history and next year will mark the 50th anniversary of the establishment of diplomatic relations between the two countries. Ts.Oyunbaatar said that Mongolia is using Russian weapons, but the future will require access to new technology and development of the Mongolian border troops, and emphasized that Mongolia needs a reliable partner country for these upgrades. Ts.Oyunbaatar noted that the Ministry of Defense Mongolia is implementing a program to renew its weapons and technologies within 10 years. This program finishes next year, and the next 10-15 year mid-term program is being drafted now. Ulaanbaatar, March 27 (MONTSAME) This measure will run within this year in Ulaanbaatar. The sides are expected to propose collaboration ways in economic and mining spheres and focus on expansion of the further cooperation. Mongolia's Minister of Mining D.Gankhuyag discussed this matter with Mr Joe Oliver, the Canadian Minister of Natural Resources, and with Mr Ed Fast, the Minister of International Trade, during an international forum of mining investors held this month in Canada. Mongolia and Canada have many similarities in nature, climate, social system, law governance and natural resources. Both countries' economies are based on the mining and agricultural sectors, so these features are to play important role in boosting the bilateral relations and cooperation, the Ministers emphasized. The Canadian side has also expressed its proposal to establish an agreement to support investments. Ulaanbaatar, March 26 (MONTSAME) Mongolian delegation are paying a working visit to Australia to study its tax system, particularly debt management and mining sphere, on March 24-30. The delegation consists of five MPs--all the members of the Standing committee on state budget, and officials from the Ministry of Finance. On Monday, they held meetings with Standing Committee on Economics of Australian parliament to talk about tax system, then had talks with professors of the Australian National University. On Tuesday, the delegation legged the State Revenue Office of the Department of Finance to share experience in tax allowance and incentive system for small- and medium-sized businesses, to consider matters related to the VAT, mining tax, royalty, rent tax, audit and debt management. Ulaanbaatar, March 26 (MONTSAME) UNESCO Director-General Ms Irina Bokova Tuesday sent a letter to P.Tsagaan, the chief of staff of the Office of the President of Mongolia. "It is my pleasure to invite You to serve as a member of the Governing Board of the UNESCO Institute for Information Technologies in Education, based in Moscow, Russian Federation," the letter says. The term of Mr Tsagaan there would run from 1 January of 2014 until December 31 of 2017. The Governing Board usually meets once a year, at the Institute. Mr Tsagaan is also a member of the World Economic Forum's Global Agenda Council on Responsible Mineral Resources Management. Ulaanbaatar, March 26 (MONTSAME) To celebrating the Nowruz festival of the Kazakh people, the Ambassador of Turkey to Mongolia Mr Murat Karagoz visited the western Bayan-Olgii aimag March 20-22. During the visit at invitation of the province governor Kh.Darmen and chairman of Citizens Representatives Khural B.Lazatkhan, Mr Karagoz was accompanied by permanent representative of the Turkish International Cooperation and Development Agency (TIKA), social and cultural advisors of the Turkish Embassy in Ulaanbaatar, teachers of the Turk Studies Department of the National University of Mongolia and others. In Bayan-Olgii, the Ambassador held a meeting with its administration, Islamic society and Turkish citizens, before visiting a school for the disabled, a nursing home, a nursery, a dormitory and an elementary school to see ongoing projects realized under funding of TIKA and the high administration of religious affairs. He also met with local business people, attended an opening of Olgii city's museum, gave an interview to the local radio and met with representatives of other provinces. After this, the Ambassador took part in a ceremony of opening a new headquarters of the religious affairs. It has been constructed with a help from Turkey. At the Nowruz celebration, Mr Karagoz offered holiday greetings of 76 million Turkish to Bayan-Olgii Kazakhs, noting the strategic importance of the province which contains many ethnic groups in a mosaic harmony and borders with Russia and China. Turkey will continue assisting Mongolia and its Bayan-Olgii aimag in many sectors, he added. Ulaanbaatar, March 26 (MONTSAME) Khustai National Park Trust (KNPT) Managing Board chief N.Enkhbold and Nature, Environment and Green Development Minister S.Oyun Monday signed an agreement to extend KNPT's term of management of the park for another ten years. The park is mostly known for its reintroduction project of the Takhi (Przewalski's horse). Since the Government declared Khustai National Park as a specially protected area in 1993, the park was managed by the Mongolian Association for the Conservation of Nature and the Environment during 1993-2003. A dedicated NGO, the Khustai National Park Trust (KNPT), was established in 2003 and signed a contract with the Mongolian Government which delegated the management of the KNP to the new NGO. The KNP extends through the Khentii Mountains and includes the western edge of the Mongolian steppe at the boundaries of Altanbulag, Argalant and Bayankhangai soums of Tov province. The park is about 100 km from Ulaanbaatar to the west. The KNP covers 50,600 ha land which is home to 459 species of vascular plants, 85 species of lichens, 90 species of moss and 33 species of mushrooms. 44 species of mammals have been recorded, including Red deer, Mongolian gazelle, Roe deer, Wild boar, Wild sheep, Ibex, Mongolian marmots, Grey wolves, Lynx, Pallas cat, Red fox, Corsac fox and Eurasian badger. The 217 species of birds include Golden eagle, Lammergeier, Great bustard, Whooper swan, Black stork, Daurian partridge and Little owl. There are 16 species of fish, 2 species of amphibians, and 385 species of insects. OSAKA, March 26 (Kyodo) – The Japan Sumo Association on Wednesday formally promoted Mongolian-born ozeki Kakuryu to sumo's highest rank in a unanimous vote to become the 71st yokozuna. His promotion was confirmed after the rankings for the summer basho in May were decided followed by a meeting of the JSA's executive board. Kakuryu, whose birth name is Mangaljalav Anand, is the first to attain the top rank since Harumafuji did so at the 2012 Autumn basho. "I am determined to focus all my efforts to train even harder and be certain to give all my strength not to defile the yokozuna name," Kakuryu said at the ceremony held at Hoganji Temple in Osaka. The 28-year-old Kakuryu posted a 14-1 record in his second consecutive tournament en route to winning his first career title at the recently concluded Spring Grand Sumo Tournament in Osaka. He received the green light for yokozuna promotion after a meeting of the JSA's Yokozuna Deliberation Council on Monday. "I am really determined that I have to give my utmost. I have to become a wrestler who is respected," he added. His stablemaster Izutsu said, "It's great that he made it this far. As a yokozuna I want him to wrestle as long as he possibly can." Kakuryu is the sixth foreign-born wrestler to be promoted to sumo's highest rank. Three Mongolian-born rikishi, including Hakuho and Harumafuji, currently sit at the top rank. March 24 (Asia-Basket) Journeyman American coach Alan Walls did not hesitate when he received a phone call from the Mongolian Basketbal Association (MBA). With coaching experience in the US, Mexico, South America, Europe, Africa and China, he seized at once the opportunity to lead the development of Mongolian basketball and become the head coach of the country's national teams. After his first five months in the capital city of Ulan Bator, coach Walls shared with Asia-Basket his first thoughts on Mongolian basketball and its future. What has been your first impression of Mongolian basketball? The first thing I noticed is that Mongolians love basketball. They love to play it, watch it in person as well as on TV and talk about it on social media. Their passion for the game is very similar to that of the Philippines. They follow the NBA intently and are just as educated about the league and its players as American fans are. On the court, their strength is the quickness of their guards and their weakness is in the post, as is the case with most Asian countries. Mongolian post players in the professional league top out at about 1.98M. The guards love to play up-tempo basketball and get out and run in transition. The biggest weakness overall is the low level of coaching. You can only teach what you know and what you have been taught. There currently does not exist a regular system for educating the coaches and raising their level of basketball IQ which will then increase the level of play of the players on all levels. That is my main mission here and that of the Mongolian Basketball Association (MBA); improving the training of the coaches and increasing their knowledge of the game. Mongolia's men national team has won only two official games in 50 years of history. How are you going to make it competitive on an international scale? It all comes down to resources, organization, planning and coaching. The current men national team has some very talented players. I think there are at least two that could play on the lower USA NCAA Div. I level and the rest on the DII level. We at the MBA really need to raise the level of resources (financial and facilities), organization, planning and coaching and the victories in international competition will follow. This summer we will participate in the Asian Games in Incheon, Korea and the goal of the mens team is to advance to the second round. On the women side, we are looking to just win one game and go from there. For 2015, the MBAs goals are to qualify both the men and women teams for the FIBA Asia Champions, which would be a first for both. The only pro-league in the city country recently concluded. Over the years it has gained momentum as an increasing number of US players joined local teams. Is this a chance for Mongolian players to raise the level of their game? The level of imports in the league has increased every year which is great for the league, the domestic players and the fans. The only way to get better is to compete on a regular basis against and beside better players. The Mongolian players are challenged by the import players to raise their level if they want to compete in the league. That will only make them better and more competitive players which will in turn pay dividends for the national team. Which local players positively impressed you the most? I have been impressed with many of the Mongolian players and look forward to coaching them on the national team. Three of the top players that have stood out to me and will be major forces for the nation team for at least the next five years or so are: Bilgunn B. and Sanchir T., both playing for the 2013-14 Super League Champions SBL team and Odbayar B. of the Hawks. Bilgunn is a 1.98m wing player that can attack the basket, shoot from beyond the 3pt line and loves to get out in transition. He reminds me a lot of Kevin Durant and he was named MVP of the Super League this year. Sanchir is a scoring machine similar to a younger Dwayne Wade. He was one of the top scorers in the Super League with many 30+point games. At the 2013 East Asia Basketball Association Championships he averaged 25.7 ppg with 39 vs. Hong Kong and 30 vs. Chinese Taipei. At the 2013 Summer Universiade in Russia he averaged 20.8 ppg including 33 in a win over Japan, 27 vs. Germany, 26 against Czech Republic, 25 vs. Romania and 21 in a win over the Philippines. At the 2013 East Asian Games he averaged 20.5 ppg with 28 vs. Chinese Taipei and 23 vs. South Korea. Odbayar is a beast in the post, though undersized for international competition at 1.98M. He makes up for his lack of height in the paint with his strength, intensity, and desire. He has some solid post moves, can finish with contact and is a rebounding machine. He reminds me a lot of NBA legend Charles Barkley. Most of local teams play 3/2 zone defense and seldom run any offensive plays. Is this just a cultural issue or there is still a gap to be filled on the coaching side? Both. As I mentioned earlier, you can only teach what you know and what you have been taught or learned on your own. It seems like playing the 3/2 zone is a national law here. I think some successful coaches started using it years ago and all other coaches just followed. Zone is easy to play and therefore easy to coach, or so many think. Part of my mission to improve the coaching is to teach the coaches a variety of ways to play and teach defense, especially man-to-man defense. I will teach them the different tactics and strategies for playing each type of defense and when to use each type based on their teams make-up and that of their opponents. You are also leading a number of initiatives to develop local young talents. Can you give us some more insights on it? I have brought with me a lot of ambitious ideas to implement with the MBA to develop both players and coaches over the next two years. I was able to secure Mongolia's first invitation to the FIBA/NBA Basketball Without Borders Asia Camp in 2014 for the country's top U17 male player and one coach, all expenses covered. We plan to start a system of basketball training academies throughout the country called the Blue Wolves Basketball Schools where players and coaches can train and coach following an organized curriculum. In November of 2013 we started the first true university league, the Mongolian Collegiate Basketball Association, with 32 mens teams and 16 womens teams. Over a six-month period a total of 562 games will be played making it the largest league in the country's history. This league will go a long way in developing players, coaches, referees and administrators. In January of this year, the MBA entered into a cooperation agreement with the Ulan Bator Provincial Sports Department to assist with the running of the Students League (ages 9-18). The MBA will assist with the competitions and I will conduct monthly clinics for the leagues coaches. The boys and girls champions of the 16-18 age group will advance to compete in Russia in their national championships that take place in May. Another major project I am working one right now is the formation of Mongolia's first basketball coaches association. On Saturday, March 15 the Mongolian Association of Basketball Coaches was formed after a two-hour clinic I conducted and a selection of leaders for the association. The purpose of the association is to unify all coaches and provide coaches of all levels regular training through camps and clinics conducted by both national and international coaches. All national team coaches will now be chosen from the membership roster of the MABC. Set in the backdrop of the beautifully barren Mongolian mountains, these photographs show the eagle hunters undertaking a centuries old tradition. March 26 (Daily Express) Teenagers - who have been training since the age of eight - are seen with their beautiful birds of prey keeping a dying part of their culture alive. The moving shots were captured by photographer Asher Svidensky who spent days trekking with the youngsters on horseback. As well as the impressive images of a lost art, he also documents the turmoil caused by daughters breaking into the male-dominated past time as young men are drawn away from their family homes. Mr Svidensky said: "I decided to focus myself; stop looking for a portrait of a centuries old image of a Kazakh eagle hunter, and instead represent the future of this ancient Mongolian tradition." The Israeli-Russian snapper who took them spent a day at a time with each of the families he shot during a four month trek in the mountains of Bayan -Ulgii province, western Mongolia. Most of his guided travels were carried out on horseback as there are very few roads in that part of the central Asian country. During that time he met the proclaimed "Youngest Eagle Hunter in Mongolia", 14 year old Bahak Birgen, who began training aged eight. Ordinarily young men don't begin their education until they turn 13 and are deemed to be strong enough to carry a full grown eagle on their arm. Having photographed Bahak for the last time, Asher had enough time and money to meet one more eagle-hunter. He chose to find a female student, to really demonstrate the future of this past-time and came across Ashol Pan with her father. "I didn't want to add an additional version of the previous shots, but rather look for something more than "another boy"," explains Asher. One of the pictures shows her release a bird as big as her whole upper body whilst stood on top of a mountain with the crisp white, snowy peaks in the distance. In the past this sight would have been unthinkable, but now girls are being taught to control these magnificent birds of prey to replace their brothers. Ashol's father, Han Gohadok, explained that his eldest son was due to take over the hunting duties but, as he had been drafted to the army, it was unlikely her would return to resume them. Despite his daughters training, Han said he would never think of making her take up the role full-time, unless she explicitly asked to do so. In the Kazakh tradition, there are many ways of training and hunting using the eagle, and each family masters their own special technique. Asher was a photographer in the Israeli army for three years before he trained to become a tour guide. Budapest, March 25 (World News Daily Report) Construction workers building the foundations of a new bridge over the Danube River in the Hungarian capitol, have unearthed a spectacular 6th century sepulchre. The analysis of the monument revealed that it was the burial chamber of a great hunnic leader, most likely that of King Attila himself. "This site is absolutely incredible!" explains Albrecht Rümschtein, an historian from the Lorand Eötvös University in Budapest and member of the team of specialists investigating the tomb. "We found many horse skeletons, as well as various weapons and other artefacts, all traditionally associated with Huns. These objects include a large sword made of meteoric iron, which could certainly be Attila's legendary "Holy War Sword of the Scythians", allegedly given to him by the god Mars himself. In fact, this definitely seems to be the resting place of the almighty Attila, but further analysis needs to be done to confirm it." Nicknamed "the scourge of God" by roman historians, Attila was the ruler of the Huns, a nomadic people originating possibly from Central Asia. He ruled from 434 A.D., until his death in 453 after a feast celebrating his latest marriage to a beautiful and young gothic princess named Ildico. He led many military raids on both the Eastern and Western Roman Empires provoquing what has become knowned as the Barbarian Invasions or the Great Migration, a large movement of germanic populations that greatly accelerated the fall of Rome and the advent of the Middle Ages in Europe. He his considered by most Hungarians, as the founder of the country. Cleveland, Ohio, March 27 (Cleveland.com) - Childhood can be tough – especially if you're an orphaned boy of 10 forced to raise your younger sister and teenage alcoholic brother. That's the situation young Amka finds himself in in the poignant Mongolian film "Amka and the Three Golden Rules." Amka, stunningly and naturalistically embodied by the young Ganzorig Telmen is a good boy, collecting cans to make money to feed his sister, and keep his family clothed and fed in their one room yurt in rural Mongolia. But when Amka finds a golden coin in the grass, he does what any young boy might with a joyous treasure – he spends it, on new sports clothes for himself. When other village boys take notice of him for the first time and ask him to play, he spends the rest on video games and eventually goes into debt. Stressed and angry about the burdens placed on him, he begins neglecting his family. But Amka is a wise boy, and realizes he needs to get back on track – and out of town when the other boys want their money back. He ventures alone to the remote countryside – the sprawling steppes are gorgeously filmed - to visit his uncle, who lives off the land and follows the old ways of life. He tries to teach Amka the errors of his ways – but can he give him the wisdom a boy so young needs o be the man of the family? The resolution should bring a tear to even the most hard-hearted viewers. Mongolian cattle herders content with the changing continental winds, causing drought and extreme cold.